This screenshot shows how sub-jobs can be used to break down and manage much larger scale jobs. See how the sub-jobs are organised by either road/house number or by function e.g. drilling, installation. 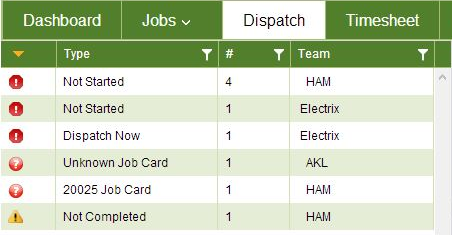 This screenshot shows how jobs and sub jobs can be scheduled and dispatched to crew devices instantly. It also shows the job state, e.g. scheduled or in progress and you can see how automated alerts keep you on top of job progress. This screenshots shows the job states dropdown menu with many options available that can be assigned to a job. This screenshot shows an automated list of jobs that need to be actioned.